The Urban Compost Tumbler gives what most of us are looking for with a compost tumbler namely a way to make compost quickly and conveniently. This compost tumbler encloses the usual compost mess in an attractive or at least unobtrusive way and transforms it in a reasonable length of time into usable compost. I doubt there is a perfect compost tumbler but the Urban Compost Tumbler goes a long way. Just remember compost tumblers help break down materials one small batch at a time. Check out our tips for tumblers page for advice on how best to make your tumbler work well. No rust prone metal parts. Simple design is almost maintenance free. Patented Central aeration system helps keep compost aerobic. Fully enclosed off the ground design eliminates potential pests like raccoons. Seals in any offensive odors that may happen from time to time. Helps keep the right moisture levels - seals in moisture in dry areas, seals out rain in wet areas. The black unit helps heat up and maintain heat inside composter. Composts both yard and kitchen waste. 60 day, purchase price satisfaction guarantee. Common Problems with the Urban Compost Tumbler UCT - 9 - and How to Solve Them. The UCT tumbles end over end. It is sort of like a big pendulum that you have to get to flip. To do this you stand to the side of the unit and start it rocking. It is something like pushing child on a swing. 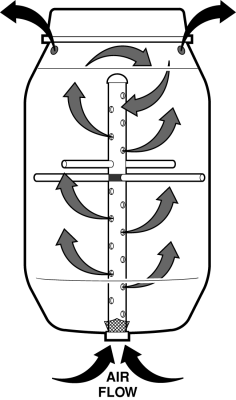 Once it is rocking well you give it an extra push down and over it goes - usually. This can get challenging for smaller people (and even some tall strapping young men) as the full compost tumbler is heavy. Ironically it works best when the composter is full. The load is balanced better and so it flips more easily. Here is an 8 second clip showing how the composter flips. As the material in the composter breaks down it will settle to the bottom. It then at times gets hard to turn. One option is just to leave it for a week or so and trust the aeration core to keep things from going anaerobic and then empty the composter and start your next batch. The lid is round atop a round barrel. However, once the urban compost tumbler is full, and especially in hot weather, the barrel part distorts and becomes slightly oval while the lid remains very round. This is very irritating. Strategies to solve this include getting a partner to squeeze the barrel to a round shape while you get the lid back on. Adding material in the cooler morning or evening temperatures also helps. The UCT-9 is not set high enough to be able to set a wheelbarrow under it to catch the compost and the inner aeration tube makes it hard to get a tool in to remove the compost a shovel full at a time. Use a tarp. Set it under the composter, take off the lid, flip it upside down and let gravity do most of the work. 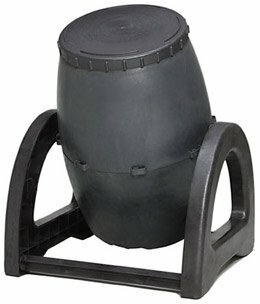 The Urban Compost Tumbler UCT-9 model is a durable model with a 10 year warranty. If used well it should bring you satisfaction for many seasons. Check out our Composting Tips for Tumblers page for trouble shooting tips.